We decided to escape our Chicago winter by flying to Miami FL to visit friends and see sites, but how ironic that winter in Chicago turned into spring with temperatures close to 70. Nevertheless, here we were in the land of sun, flowers and yes alligators. We took a gorgeous hike through Fairchild Botanical Gardens where streams gleamed and pink, red and purple flowers adorned the paths. 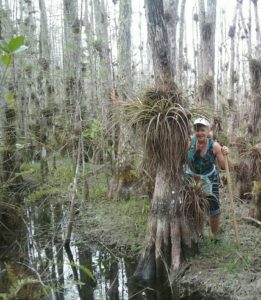 But now Larry was ready for something meatier or should I say downright scary—-a hike in the FL Everglades. 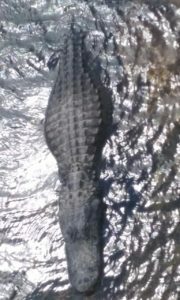 As we walked along the boardwalk, we were greeting by large, healthy alligators enjoying a sun bathe in the river below. I had never in my life been that close to them. Never a dull moment with you guys! That’s awesome. Last time I got that muddy was portaging a canoe in the Boundary Waters. But, there’s no gators there! Yes, Larry would have gone further if he didn’t have a wimp for a wife. So glad to see you and your kids having a great time in AZ.